If you read Part I of this series, you know that I’m building a model to judge the net present value of the 2012 decision for Larry Scott and the Pac-12 to not bring on a strategic partner for the Pac-12 Networks. Crucially, I’m judging this decision based on the time value of money, specifically an 8% cost of capital. 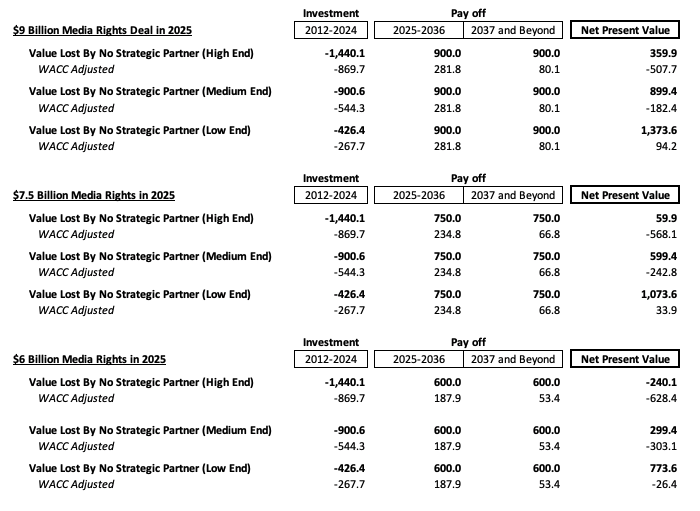 The Pac-12 Networks likely will miss out on somewhere between $276 to $869 million over the 12-year period from 2012 to 2024 by not joining with a strategic partner. That means that to justify this decision, the media rights deals signed in 2025 and beyond need to be worth something like $9 to $12 billion dollars, or three to four times the value of the current deal. Let’s take a step back and explain how I got there. If back of the envelope math is the quick way to run numbers—which I did last time—I’d call “top down” the easy way, though it can still take a lot of time. Essentially, you take your opinion on what certain things are worth, and use them to calculate revenue, then flow that on down to your profits. The key improvement with this method is I’m going to account for the time value of money. When I first stumbled on these projections, I was stoked frankly. (Can you tell I’m from California?) These numbers are basically the perfect fill-ins for a “top down” analysis. Assuming the Pac-12 did a 70-30% split (which is a little lower than the Big Ten’s 51-49% split but I’m okay with it), then in the middle case, the schools would have taken home $7 million each year after the partner cut. In the low case, they’d take home about $5 million, which is close to our $4 million back of the envelope number. That said, even that may be too low. The SEC Network launched and it added about $20 million to each school’s distribution. Even if you think the SEC Network (and B1G, which launched much longer back) aren’t comparable because of their bigger geographic regions, the ACC feels pretty comparable. When its network launches next year, it expects distributions to increase by $12 million per school. Looking at those comps, using $10 million as high case seems reasonable too. So how much do the rights need to be “worth” in 2025 and beyond? In the middle case, this is only $900 million in lost revenue, discounted to $544 million. (About where our back of the envelope got us!) At the lower end, the Pac-12 needs to make up $267 million. Two things complicate this, one of which helps the Pac-12, one of which hurts it. Let’s start with the pain. At first glance, you look at $544 million, and you think, “So if they sign a $6 billion dollar deal in 2024, then they’ve done it!” Well, not quite. See, a $6 billion dollar deal in 2024 isn’t worth $6 billion in 2012 terms. In net present value calculations, everything needs to be discounted to the same year which is 2012 in this case. At 8% cost of capital—which is my preferred number since, as the current progress of the Pac-12 is showing, media is a risky business—well a dollar in 2025 (when the new deal would start) is only worth 39.6% of a dollar in 2012. Put another way, if I had to invest in a bunch of media stocks, and I couldn’t take my money out until 2025, I’d need it to grow at an 8% rate to justify the risk. Why did I pick 10% ownership? First, it’s a nice round number. Second, it does make sense. 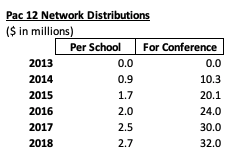 If the Pac-12 had given up half of their Tier 3 rights to a partner to launch the network, and since the networks are about 1/3 of the value of their media rights, that’s about 16%. If they had held to only 30% ownership, that’s about 10%. Moreover, they’re currently selling 10% of the Pac-12 Media Rights, so it makes sense that that was Larry Scott’s ceiling of ownership dilution. I picked three different media rights values to put the three scenarios in context, again a high, medium and low. In the high case, the Pac-12 Media Rights triple in value to $9 billion starting in 2025. In the low case, they double to $6 billion. In the medium case, they are $7.5 billion, which is what the Pac-12 is currently shopping them for. If we just stopped here, well this would be pretty indicting of the strategy. Basically, under all but the most pessimistic partnership scenarios—and right now strategic partners are batting 1.000 with the SEC, B1G and soon-to-be ACC networks having added plenty to the bottom line—then the Pac-12 would need a phenomenally valuable deal, something like $12 billion dollars unadjusted dollars to justify foregoing a strategic partnership. You can use your own judgment on whether these sky high deal values make sense for the Pac-12. Some of you could note that I’ve referred a few times to a “second twelve years” from 2025-2036. But technically, ownership would go beyond that time. Into eternity. This is what could help justify the Pac-12’s decision, ownership in perpetuity. Unfortunately, a dollar in 25 years at an 8% discount rate is only worth something like 14 cents, so while I included this terminal value, it is pretty heavily discounted. Basically, if the next media deal doesn’t make up the lost revenue, the decisions in 2036 likely won’t either. If it isn’t clear, this is a complicated problem that requires forecasting both a hypothetical “how much would we have made if we had a strategic partner?” and the future, “How much are media rights worth in 2025?” My goal was simply to set out the scale of the problem. And despite rosy assurances, I think the Pac-12 likely lost too much potential revenue by maintaining 100% ownership in its network. Even if the network signs a $7.5 billion dollar deal in 2025, the network will likely have just barely made money. And if you assume either of the more optimistic scenarios, then the Pac-12 Conference likely lost plenty of money. I just want to write a quick thank you to Jon Wilner at the San Jose Mercury News whose reporting is just phenomenal on this subject. He’s broken down the Pac-12’s released finances each year going back to 2012 and he pointed me to the Form 990s (which I found on Propublica). He also provided the details on the Pac-12 Tier 1 media rights deal. Jon Canzano at Oregon Live also had a ton of insights into the operations of the Pac-12 that informed this article. Finally, the Podcast of Champions by David Woods and Ryan Abraham does great weekly coverage of this league and encouraged me to sign up for Wilner’s newsletter.